AC/DC have built an empire based around three chords. For the rest of us, however, it might take a little more than that - and that's where Chorducopia comes in. 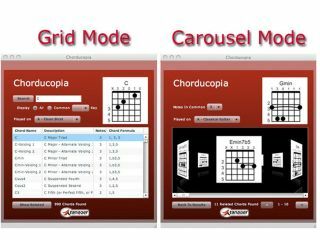 In what promises to be perhaps the most innovative and useful chord library available for songwriters, recording musicians and music educators, Chorducopia from Tanager Audioworks contains a searchable database with over 50 chords for every key, and runs on both Windows and Mac computers. The tool allows the user to search for possible chord substitutions as well as listen to the chord played by a variety of guitars and pianos. The chord library was developed from extensive research of rock, pop, country, jazz and blues music. High-quality audio recordings of every chord being played are utilized, eliminating the need for special MIDI hardware or software. The user can simply click on a chord name and it will play on any computer equipped with any sound card. Chorducopia takes advantage of the new Adobe AIR rich internet application (RIA) development environment. Personally, we're a little tired of searching for the lost chord, so this comes as welcome news. Chorucopia retails for $34.99US as both an immediate download from the company's website, or it can be shipped CD-ROM. Product demonstration videos as well as a demonstration version can also be found here. For more information, visit the official Tanager Audioworks website.